Individual reading goals can be configured on the public side of a program. This article covers information related to configuring/managing an individual reading goal on behalf of a participant. For information on the public side experience please visit the Personal Reading Goal article. To add or edit a participant's personal reading goal, navigate to the Find Patron page. Select the clickable number next to the Personal Goal(s) label. If the patron is registered for more than one program, you will need to select the program. 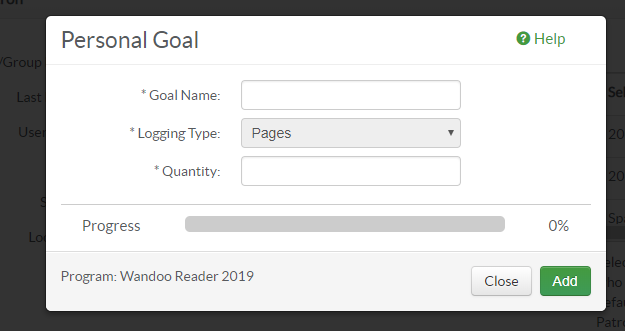 The goal name and goal quantity are required fields. The progress updates as the participant progress towards their goal. 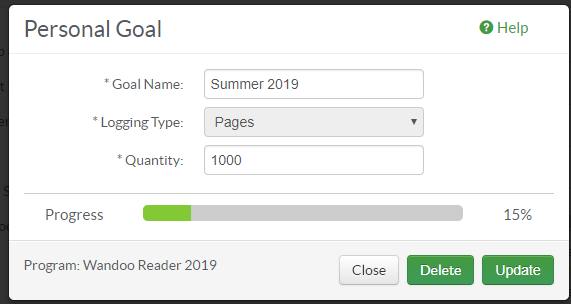 The percentage completed of a personal reading goal can also be included in the Patron and Log Details reports. More information on Wandoo Reader's reports can be found in the Reports Article. Posted - Mon, Mar 11, 2019 at 7:46 PM. This article has been viewed 269 times.